A 4,000-year-old £2m Egyptian statue is at the centre of a legal row between its owner and the Northamptonshire council that wants to sell it. The statue of Sekhemka was gifted to Northampton's museums by the fourth Marquis of Northampton in about 1880. The borough council plans to sell it and use the money for heritage schemes. The sale has been challenged by Lord Northampton, a descendant of the marquis, who says the council does not have the right to sell Sekhemka. The 30in (76cm) limestone figure of a court official clutching beer, bread and cake - items for the afterlife - is believed to have been acquired by Spencer Compton, the second Marquis of Northampton during a trip to Egypt in 1850. It was presented to the museum by his son some years later. Northampton Borough Council said the statue's value made it too expensive to insure and secure, and its sale could benefit other local heritage and cultural projects. 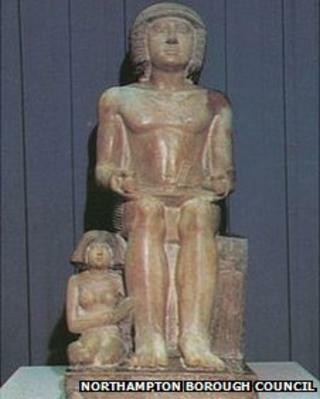 Sekhemka did not represent a "key part" of the town's history, officials said. However the decision to sell the statue was opposed by some local people who formed an action group to "save" the statue. Lord Northampton, the seventh Marquis of Northampton, has now joined the argument, saying: "I am taking legal advice about whether NBC [Northampton Borough Council] has the right to sell any or all of the collection which my ancestor gifted to the museum." A council spokesman confirmed Lord Northampton's legal team had been in touch, and added: "As this is now a legal matter, it would be inappropriate to comment further."